Texas Dachshund Rescue View other Dachshunds for adoption. 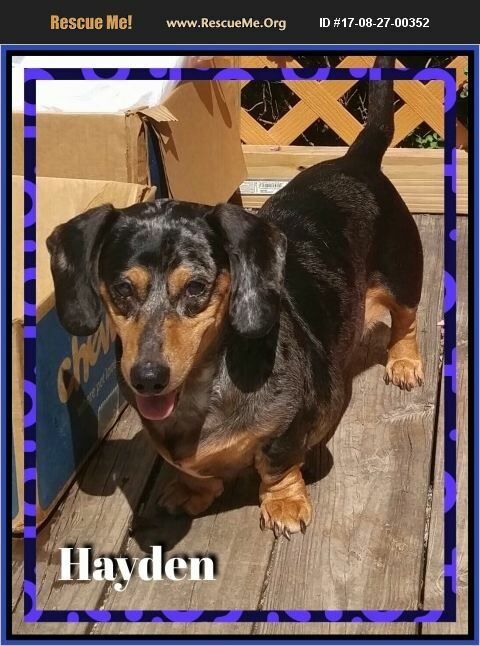 Hayden is a handsome 22 pound standard dapple dachshund who is 13 years old. Standard dachshunds are getting very difficult to find and they are well known for their calm, gentle demeanour. Hayden is blind but copes very well in a consistent environment. He will follow your voice and any tapping sounds on walls and floors and make his way to you because he just loves EVERYONE! Hayden is wonderful with children and doesn't bother kitties. Hayden is submissive towards other dogs and would not do well in a home with another dog who likes to engage in rough play. Hayden is comfortable where ever he is and doesn't display any anxiety. In his wonderful foster home in Texas, Hayden sleeps on a pillow on the floor beside the big bed because his foster mom doesn't want him to fall out of bed, however, Hayden loves to get on the bed and have special loves and cuddles. Hayden enjoys car rides and like most dachshunds he loves a good tummy rub. He isn't a fussy eater and enjoys his food. Hayden's favorite treat is tomatoes! Hayden is pee pad trained but does not ask to go outside. He will have have accidents in his crate if left for extended periods. Hayden is a very special boy. Standard dachshunds are getting hard to come by and this very special boy is going to bring joy to someone's heart. Are you the lucky one who will open their arms and heart to Hayden?